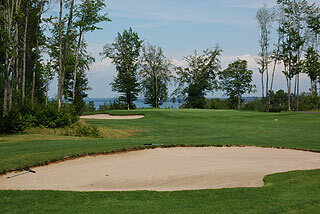 Wild Bluff Golf Course in Brimley, located just west of Sault Ste Marie in Michigan's Upper Peninsula, is a prime golf property that has been justly awarded 4 1/2 stars from Golf Digest Places to Play. Situated on a natural bluff overlooking Waishkey Bay, this 7022 yard championship design features immaculate course conditions and awesome views of the Bay, St. Mary's River, deep and natural ravines, and the winding rivers and streams bordering the Hiawatha National Forest. 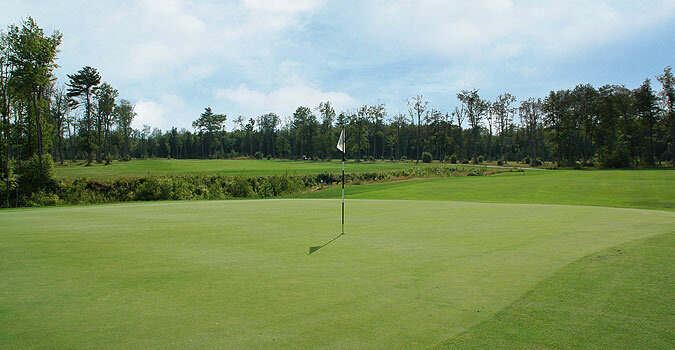 Wild Bluff boasts outstanding amenities ranging from practice facilities that include an expansive range, putting greens and a short game area - to a clubhouse that features a restaurant, lounge and pro shop. The course is part of the Bay Mills Resort & Casinos, which provides comfortable accommodations, convention and meeting facilities, and a full service casino with slots and all the standard table games. A number of dining options at the resort and clubhouse are available to visitors. For more information and photos on the Bays Mills property click here. 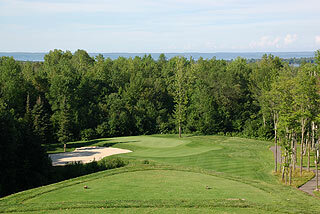 Wild Bluff Golf Course is designed so that every player can find a reasonable and fair challenge. Large greens and tees compliment rolling fairways with wide landing areas. There is enough trouble that most golfers will need all their skills to play to their handicap - but the views and conditions are such that even novice players will appreciate the experience. If you plan on playing in August prior to the Bay Mills Open, be prepared for some challenging rough - about 4 inches in length and extremely difficult to recover from. There are a few forced carries - but most are reasonable in length. The natural areas and ravines are obstacles you will definitely want to avoid. The five tee areas on each hole are defined by color-coded dice, and range in length and slope from 7022/136 (blacks), 6774/133 (blues), 6120/125 (whites), 5580 - 120/129 (golds) to a comfortable 5299 yards with a 125 slope from the forward tees. This is no walk in the park - but keep it on the fairway and you will be rewarded with some good scoring opportunities. Land in the second cut or long rough and par will be a struggle. The greens, while running true and very putt-able, are often raised or crowned on one or two sides, making accuracy of approaches a priority. ParView GPS on carts provides accurate yardage and hole location information there are also yardage plates at 100, 150 and 200 yards are accompanied by similar markings on the cart paths. The GPS also provides a menu for ordering food at the 9th hole (which can be picked up prior to #10). 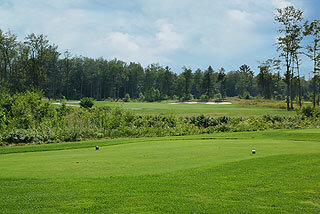 The opening hole plays from an elevated tee and can almost be reached from the white tees. A shot aimed to the right side of the fairway will leave a wedge approach to a raised green with a bunker left and grass swale right. 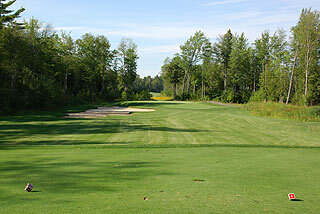 The right side of the fairway is also the best location on two, which bends slightly left of a crowned putting surface. These are 2 score-able hole. The third doglegs right with plenty of room on the approach. Length is the name of the game here (468 from the tips), but an easy bump and run can still lead to an up and down par. Players from the mid tees really get a break on the par 4 fourth (370 versus 440 yards). There is more room on the fairway than appears off the tee. The fifth completes a 3-hole stretch of par fours that average over 450 yards from the black tees (just 372 from the white tees). 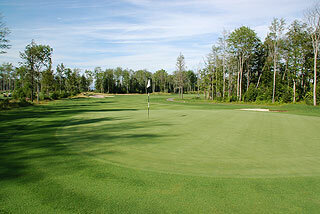 The par 3 sixth is simple if you hit it straight - but keep in mind that there is no room long, and left is trouble. A tee shot aimed to the inside of the right fairway trap will leave a clear approach and a possibility of a low score on the par five 7th - which is listed as the number one handicap. 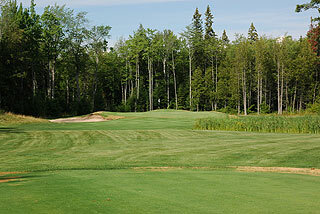 There is a pond just in front of the tall pine to the right of the 8th green making this a challenging par three. The finishing hole on the front is one of the most interesting of the layout - a 545 yard par five that invites a tee shot to the left center of the fairway. There is a water-filled ravine about 120 out, that comes into play more quickly on balls hit left center. 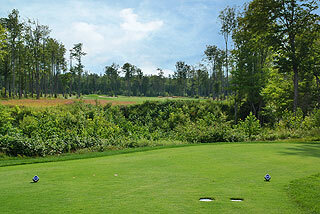 Long hitters can shoot to the left side past the hazard, where a 40-50 yard wide fairway awaits. 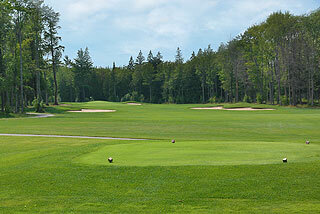 Another option is to play it to the right just in front of the ravine, and approach with a wedge/short iron. The tenth exemplifies the difference in distance between the black (438 yards) and white (317) tee areas on this course. There is a world of difference - and the blue tees are only a couple hundred yards shorter than the tips. With the degree of difficulty here, we suggest the white tees for the mid-handicapper/average golfer. You must be on the left side of the fairway to see the green on the par five 11th, which bends to the right about 200 yards away. The fairway narrows with a pond along the left side. Twelve turns in the opposite direction, with the right fairway trap providing a good target area. There is a huge bunker short left and a marsh area short right on the par three 13th, which precedes another long four par - and one of the narrowest driving holes of the layout. Fifteen plays from an elevated tee, and is a gorgeous golf hole. There is plenty of room short, which is better than long here. The short par four 16th presents plenty of room off the tee, but a creek and natural area left plus a kidney shaped pond right create a demanding approach. Long hitters can aim left of the right fairway trap off the tee on 17, setting up the possibility of reaching in two. Most golfers will approach this as a 3 shot hole however - with play along the left side of the fairway setting up for an uphill approach. Be aware of the creek crossing about 190 away. The closing hole is spectacular - an elevated tee playing to a wide fairway with the clubhouse and bay in the distance. Aim between the fairway bunkers and a good finish is possible. Long hitters and low handicappers will love the challenge at Wild Bluff. 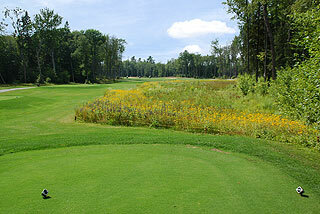 Average golfers will applaud the natural beauty, and can score well if the correct tee areas are chosen. As a 13 handicapper, I found the white tees to be fair game - and the blues to be much too long at just under 6800 yards. 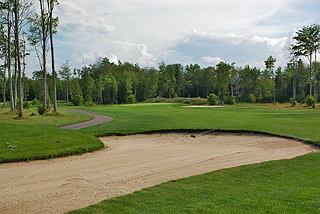 Great practice facilities - come out early to use the short game area and practice bunkers. A sandwich, salad or beverage at the clubhouse lounge or terrace puts you in a nice setting - and the pro shop stocks clubs as well as clothing and accessories. Green fees include cart and range balls. Great facility, wonderful course, friendly service - this is a great golfing value - and highly recommended. Stay and Play packages are available through the Bay Mills Resort (www.baymillscasinos.com).